First and foremost, your security program must account for basic security hygiene, which creates the basis for arguing legal defensibility; which is to say, if you're not doing the basics, then your program can be construed insufficient, exposing your organization to legal liability (a growing concern). That said, what exactly constitutes "basic security hygiene"? More recently, I learned of the OWASP Cyber Defense Matrix, which takes a similar approach to mine above, but mixing it with the NIST Cybersecurity Framework. 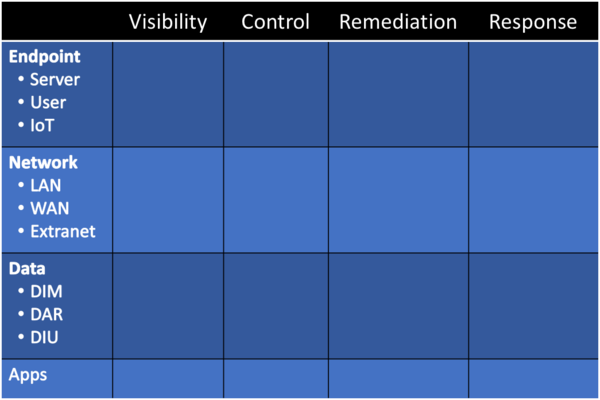 Overall, I like the simplicity of the CDM approach as I think it covers sufficient bases to project a legally defensible position, while also ensuring a decent starting point that will cross-map to other frameworks and standards depending on the needs of your organization (e.g., maybe you need to move to ISO 27001 or complete a SOC 1/2/3 certification). One of the oft-overlooked, and yet insanely important, aspects of designing an approach to optimal security for your organization is to understand that it must exist completely within the organization's culture. After all, the organization is comprised of people doing work, and pretty much everything you're looking to do will have some degree of impact on those people and their daily lives. As such, when you think about everything, be it basic security hygiene, information risk management, or even behavioral infosec, you must first consider how it fits with org culture. Specifically, you need to look at the values of the organization (and its leadership), as well as the behaviors that are common, advocated, and rewarded. If what you're asking people to do goes against the incentive model within which they're operating, then you must find a way to either better align with those incentives or find a way to change the incentives such that they encourage preferred behaviors. We'll talking more about behavioral infosec below, so for this section the key takeaway is this: organizational culture creates the incentive model(s) upon which people make decisions, which means you absolutely must optimize for that reality. For more on my thoughts around org culture, please see my post "Quit Talking About "Security Culture" - Fix Org Culture!" Much has been said about risk management over the past decade+, whether it be PCI DSS advocating for a "risk-based approach" to vulnerability management, or updates to the NIST Risk Management Framework, or various advocation by ISO 27005/31000 or proponents of a quantitative approach (such as the FAIR Institute). The simply fact is that, once you have a reasonable base set of practices in place, almost everything else should be driven by a risk management approach. However, what this means within the context of optimal security can vary substantially, not the least being due to staffing challenges. If you are a small-to-medium-sized business, then your reality is likely one where you, at best, have a security leader of some sort (CISO, security architect, security manager, whatever) and then maybe up to a couple security engineers (doers), maybe someone for compliance, and then most likely a lot of outsourcing (MSP/MSSP/MDR, DFIR retainer, auditors, contractors, consultants, etc, etc, etc). However, don't get wrapped around the axel too much on how the picture fits together. Instead, be aware that your basics come first (out of necessity), then comes some form of risk mgmt., which will include gaining a deep understanding of org culture. The other major piece of a comprehensive security program is behavioral infosec, which I have talked about previously in my posts "Introducing Behavioral InfoSec" and "Design For Behavior, Not Awareness." In these posts, and other places, I talk about the imperative to key in on organizational culture, and specifically look at behavior design as part of an overall security program. However, there are a couple key differences in this approach that set it apart from traditional security awareness programs. 1) Behavioral InfoSec acknowledges that we are seeking preferred behaviors within the context of organizational culture, which is the set of values of behaviors promoted, supported, and rewarded by the organization. 2) We move away from basic "security awareness" programs like annual CBTs toward practices that seek measurable, lasting change in behavior that provide positive security benefit. 3) We accept that all security behaviors - whether it be hardening or anti-phishing or data security (etc) - must either align with the inherent cultural structure and incentive model, or seek to change those things in order to heighten the motivation to change while simultaneously making it easier to change. In writing, it says that behavior happens when three things come together: motivation, ability, and a trigger (prompt or cue). We can diagram behavior (as above) wherein motivate is charted on the Y-axis from low to high, ability is charted on the X-axis from "hard to do" to "easy to do," and then a prompt (or trigger) that falls either to the left or right of the "line of action," which means the prompt itself is less important than one's motivation and the ease of the action. We consistently fail in infosec by not properly accounting for incentive models (motivation) or by asking people to do something that is, in fact, too difficult (ability; that is, you're asking for a change that is hard, maybe in terms of making it difficult to do their job, or maybe just challenging in general). In all things, when we think about information risk mgmt. and the kinds of changes we want to see in our organizations beyond basic security hygiene, it's imperative that we also under the cultural impact and how org culture will support, maybe even reward, the desired changes. Overall, I would argue that my original pyramid diagram ends up being more useful insomuch as it encourages us to think about info risk mgmt. and behavioral infosec in parallel and in conjunction with each other. Obviously, much, much more can be said about the above, but that's fodder for another post (or a book, haha). Instead, I present the above as a starting point for a conversation to help move everyone away from some of our traditional, broken approaches. Now is the time to take a step back and (re-)evaluate our security programs and how best to approach them. This page contains a single entry by Ben Tomhave published on August 6, 2018 12:55 PM. Forget C-I-A, Availability Is King was the previous entry in this blog. Business Must Change: InfoSec in 2019 is the next entry in this blog.